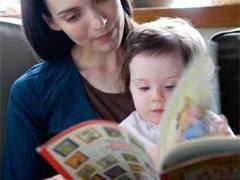 Holding your toddlers attention may be a challenge, but its never too early to read to your child, and the learning payoff can be huge. Choosing books that will keep the interest of your little one will make story time more enjoyable for both you and your child. What makes a good read for a toddler and what are some of the best books for little ones? * Simple Text. Fewer words on each page will help your child stay focused as the pages change more frequently. No more than one sentence per page will help hold his attention best! * Colorful Illustrations. Little ones are captivated by bright colorful illustrations. Simple illustrations will help your child stay focused better than complex or busy pictures. * Repetitive Text. Books that contain the same phrase over and over are sure to have your toddler chiming in as you read. * Familiar Subjects. Choose familiar objects such as animals and stories that contain the everyday routines, activities and experiences that are recognizable to your child. * Interactive. Young children learn through their senses, so books that contain lift-a-flaps or textured materials for your toddler to feel help make the book more interesting. * Sing a Story. Your child is sure to tune in when you show her a book set to the words of her favorite song! Many classic childrens songs have been made into adorable childrens books that you can sing with your child. * Sturdy Binding. Find books that are made of materials that your child can play and read over and over without tearing or ruining them. Board books (with strong cardboard pages), fabric, or plastic books are all excellent choices for toddlers.